John Brandt, editor and publisher of Industry Week Magazine served as moderator of the panel (Roger Cloutier of Genmar, John Relyea of KeyBank, Clint Moore of Volvo Penta, Al Fink of Stingray Boats, Tony Gasperich or West Marine and Dave Sundin of Crownline Boats.). 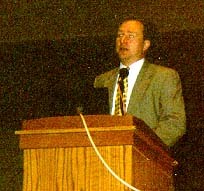 Thom Dammrich, NMMA president is shown at the podium making the introductions. A photo of Mr Brandt at the podium is at the bottom of this page. Session Format: Mr Brandt opened the session with an e-commerce presentation including some specific comments regarding the boating industry. He then turned it over to the panel for some input from each member. This was followed by responses to previously collected questions. At the end, questions were fielded from the audience. In the past, the richest person on earth was always associated with the oil industry, now it's Bill Gates. The market value of companies (total stockholder value) is the value of future earnings discounted to the present. He is seeing new job titles, Chief Value Chain Officer (creates value for customers). Value is fundamentally determined at he point of the end user: Delivery, total cost of ownership, data and information, value or solution bundles (product and/or service is a total solution), business expertise and brand experience. GM doesn't make cars, they provide safe and secure transportation (note the ONSTAR service). PT Cruiser was designed online with customer feedback from the web. The large U.S. automakers are forming a major trading exchange, COVISINT. RBBI Note: The first actual trade on this exchange occurred Oct. 9, 2000. It is now operational. Ford moved from viewing their products as a car to viewing them as safe and secure transportation and now to viewing them as an experience. ("In car" internet access, etc). RBBI Note: This talk was delivered before the Firestone tire situation reached crisis proportions. The customer doesn't care who's part it is, we have to fix it. Inventory has became a game of musical chairs. Don't get caught with the inventory when the music stops. Information about your shipment (exact contents, condition of shipment, location of shipment, serial numbers, anticipated delivery time, etc.) can be as valuable as the shipment itself. If you can make your customer less nervous than your competitor, your customer will pay more. Gilbarco Interactive (Marconi Commerce Systems) makes gas pumps for service stations. By adding value (credit card processing at the pump) to a product that had almost become a commodity, they are able to significantly increase the price of the product. You need to map the customer value creation process from beginning to end, regardless of process ownership. Reorganize your company and value chain around customer value propositions. Toilet (commode) industry. American Standard, a major toilet manufacturer, calls them China Ware (sounds much better). They have a "Process Owner" for "China Order Fulfillment". This person is responsible for every step. If people ask questions, they do not have to "hand it off." What they do not know they will go find out. Kodak is no longer in the "film" business. Shutterfly.com creates a website for your photos. You can pick specific photos, delivery point and time and have real photos sent to your kids grandparents or whoever you wish. You can allow specific individuals access to specific photos on your site/ It archives your photos. You can have photos shipped anywhere anytime. Camera Kiosks in China - You can borrow a digital camera, take a photo, download it into the kiosk and make it available for viewing by others in China for a fee. What are you doing to deliver information on the web? Provide mobility? Have you demonstrated to your customer the data about your product might be more valuable than the product itself? Have you mapped your customer value creation process? Have you used IT (Information Technology) to reorganize around customer value? Mobile commerce will hit soon! He looks at three components of e-business. He uses the net as a communication tool, like a telephone on steroids. He used a computer presentation (via laptop to big screen) to discuss their e-business strategies. WestMarine.Com - They have a catalogs, stores and an online presence. Customers shop how ever they want to. Its their choice. Prices and promotions are the same across all channels. They have 48,000 products online. They used increased personalization. They used sailing, water sports, powerboat, etc. sections to guide customers to their area of interest. The various sections have content articles with hyperlinks directly to the products mentioned in the articles. They had a knot tieing article online. They added links to ropes, splicers, etc. Then at the end of the article, they relist all the product links referred to in one spot. In this manner they are able to use "advisor" / how to articles to sell stuff. This method has worked very good for them. They provide interactive product selectors to aid customers in selecting the specific unit they need when a large number of choices are available. For example, they have hundreds of anchors. The anchor selector asks you a few questions and narrows the choices down to just a few units for further study. For products with accessories - they provide links to all the accessories at the bottom of the page. You can actually buy them all together. Their web site is designed and maintained in house. The marine industry is a long ways from the auto industry on the just in time program. They have had a hard time getting suppliers to use bar codes. E-commerce will force everybody to step up and become more professional. Everybody is currently on another plane. They are trying to develop a specific site for each customers boat (like some of the computer service sites that provide a service site for your exact machine with your name on it). He answers a lot of consumer email himself over the last three months. If he hears a question more than once, he puts it in a FAQ. If customers cannot find it easy, he will tell them the answer anyway. He is tracking statistics on his dealers use of the net. He looks at the hits for their pages and how quick they answer e-mail. Each model year he creates three groups of dealers (top ten, middle ten, lowest 10) based solely on the increase sales over the last model year. In almost all cases those are the dealers also using the net the hardest. He can see dealer inventory online, dealers can only publish MSRP pricing online. All his data is database generated and all the sites have dynamic pages. Consumers can build a boat online (create a boat of the model size, colors, options, etc). Over the last 18 months, 19 percent of these requests have resulted in purchases. Only 1/2 of one percent of traditional dealer info card requests result in purchases. The online results are astounding. His Customer Service Index survey is turning up lots of comments at an exponential rate from the web site. These responses are proving very good and helpful. Internet reports of the progress of their boat through the shop improves credibility with customers. By January 2001 they hope customers can go to a boat show, view dealer inventory, plus view those being built. The dealer can change color patterns on a boat prior to gelcoat on the fly. Everything is driven off gelcoat time. You can change anything up to that time. You can pat the consumer on the back electronically! They hope to have their new "Owners Only" site up in three weeks. It will allow customers to access their warranty information and history. Stingray can promote service times online (remind owners of annual service needs) and provide an online service manual. Consumers can use and transfer use of this site when selling the trading or selling the boat. This time it only took one hour to change from 2000 model year to 2001 model year online. It is all database driven. Shooting the pictures took a lot longer than changing over the web sites. Be careful using static web pages with prices. They get picked up by the search engines and remain in them long after the boat is sold. He explained how the content of dynamic web pages is not indexed by the search engine. Once search engines pickup a cheap price, even if it was a boat a dealer needed to unload because he got caught with too many of the same unit at the wrong season, consumers see the cheap price and demand the same cheap price from other dealers. He and Al (Stingray Boats) go back a long ways. He was in Al's backyard when the first Stingray was being built. Volvo Penta's goal is to transform themselves from a wonderful old world company to a new world powerhouse by 2003. All of us are in various stages. Within your company are new world thinkers. They are your tools. Listen to them and give them a chance, let them run. The president and CEO of the Volvo Group is committed to e-business. You need to start your e-business efforts small, grow them fast and grow them everywhere. Volvo believes its path to the future is built around its existing dealer network. Their will be a sharing of infrastructure with customers and partners. "This technology makes it possible to have the kind of relationship with the boater that a boater deserves. His wife recently got out a typewriter. His 7 year old kid says, "Mom, what's that?" The traditional definition of a market is changing. Indirect lenders are changing. Customers are changing. They want and expect information at all hours. Product information is a real leveler. It does not matter if you are a mom & pop or a giant lender, you are still just a 15 inch screen to them. In the old world if you had a dissatisfied customer, they might tell 10 people. Now, they might tell 10,000 on a message board. Key needed to refocus its efforts in a consumer oriented manner. Industry pricing information will soon be public information. He expects real boat pricing information on the net in less than six months. REAL PRICING, not MSRP. Right now most builders do not even want MSRPs posted. Soon you will be able to buy a boat (financing) in 7 to 10 minutes on a palm pilot at a boat show. He encouraged regular task force meetings. Competitive industry awareness. They watch the web sites of others for creative ideas. Extranets - Boat brand communication to dealers for each brand. Their extranet investments had a payback period of less than six months. B2C - they support Boats.Com. It will create a level playing field. Manufacturing Processes - Monitor their VEC hull forming process via the net. Monitor and evaluate VEC throughout the entire organization. They use the net to leverage this core technology of talent. B2B - they support MAREX. MAREX has been into several of their plants. Wellcraft and Glastron has been transacting some business via MAREX. The Beta phase is now over. Buyers are incredibly enthusiastic. Can you evaluate the quality of a part online? They are sourcing goods online that are better engineered by their engineers and their supplier's engineers. Dave Sundin of Crownline Boats: We use it as a communication tool. Your communications can mesh with the specific segment you are addressing. Each audience has a different need and direction. With their old process, orders often had to be rewritten 5 or 6 times (as a quote, changes were made, then the customer comes back to the dealership and the order is written all over again, written again by the sales manager, then it is called in to the builder and re-entered several times. If we can get digital input at the quote stage, then it is much easier to change and push on up the system. Volvo Penta is trying to stay with the dealer chain. How might it change? Clint Moore of Volvo Penta: Volvo does not want to sell to end users directly. They are committed to their stand on this issue. They want to partner with their existing network. 20 percent of our customers are who 80 percent of our business will be with. What does Boats.Com bring to strong brands like Wellcraft. Why not just use Wellcraft.Com? Roger Cloutier of Genmar: Boats.Com will generate leads and feed them to the dealers. Dave Sundin of Crownline Boats: Boats.Com will provide a centralized unbiased level playing field. It will get lots of page views and generate lots of traffic. Al Fink of Stingray Boats: Current boat owners may bypass Boats.Com. New owners may go there. He does not see Stingray as a manufacturer providing website content (articles, news, etc), Boats.Com can do that. How can we all talk back and forth to each other and to suppliers? Roger Cloutier of Genmar: Use MAREX. Earlier we heard data is as important as the product itself, how does this apply to the boating industry? Tony Gasperich or West Marine: We provide order summaries and detailed summaries. If you collect data on customers you know a lot about them. Al Fink of Stingray Boats: Often the customer can't find the information he wants. We get calls about how to pump out the porta potty, how to put up the canopy, etc. The customer can't find the manual years later when they need it, especially not the manuals for all the little things on the boat. They try to stick all the little manuals in bags on the boat, but the accessory type manuals often fail to make it to the customer. Stingray is in process of scanning in all these manuals to make them available to their customers. These problems are really evident in second owners who rarely even receive the manuals. Internet pricing - if web sites don't contain price information consumers move on till they find a site with a price? Dave Sundin of Crownline Boats: The market on your desk is the world. The old local publication / newspaper ad was different. The cost of selling a boat in New York is greater than the cost of selling a boat in Wichita. Price information for boats is drastically different across the country for current product. Used boats and carry over boats are different. Let's post MSRPs so customers have some idea of pricing, then let dealers set the price based on what he can sell it for in his market. Al Fink of Stingray Boats: They have been using MSRP for three years for options. Dealers want the MSRP for options in the catalog, it gives the option a value. In most cases dealers get full MSRP for options, but not for the boat. MSRP at least gets the customer in some arena to price. John Brandt, editor and publisher of Industry Week Magazine, opened the session with a presentation and then moderated the panel. Sorry about the poorly exposed photo. Wonderful session. Very interesting. It was booked for an hour and a half and could have ran much longer. It would have been nice to have some more question and answer time. Great to have such an open discussion on net applications. Perhaps a 100 plus in attendance. A big thanks to all those who served on the panel and to Mr. Brandt for his thought provoking / mood setting presentation. Someone remarked about their only being about a hundred in attendance, they hoped the industry would have sent many more to attend. I recall a couple years ago when only about a dozen of us gathered for a similar meeting at IMTEC in Chicago. Progress is certainly being made, but a lot remains to be done. Getting a grasp on the opportunities of the net is not a one step hit, it is an ongoing process and this forum was a big step in the right direction.